Ellesmere is a friendly quiet lakeside market town in North Shropshire, that dates back to Saxon times. The market is on Tuesday, Ellesmere having been granted a market charter by King Henry the Third nearly 800 years ago in the year 1221. The town’s floral displays have won ‘Britain in Bloom’ prizes over several years. Ellesmere has car parks, shops, banks, pubs, restaurants, cafés and tea shops. Camping gas is available from the local petrol station or builders’ merchant. Don’t miss the bread and butter pudding at the local baker’s shop – Vermeulen’s Delicatessen. For antique collectors, there are three antique shops plus a Sunday antiques fair in the new Town Hall each month. You may also find a bargain at the massive Chirk Airfield car boot sale open every Sunday morning and on Bank Holiday Mondays. Nearby Chester and Shrewsbury also have lots of antique shops. The lakes (called ‘meres’) around Ellesmere have resulted in the area being called Shropshire’s lake-lands. They are famous for their water fowl, with nature trails to observe the bird life. Swans, geese, ducks, coots and herons are the most common. In addition to the canals, there are 9 named lakes in the area: The Mere, Blakemere, Colemere, Crose Mere, Hanmer Mere, Kettlemere, Newton Mere, Sweatmere and Whitemere. ‘The Mere’ is the biggest and is a few minutes’ walk from the middle of Ellesmere. Ellesmere is on the Shropshire Union Canal and has the Blackwater Meadow Marina for canal boats. We sometimes find that people stay at Birch Hill in order to meet friends on canal holidays. Due to Ellesmere’s one-way traffic system, we are probably the most convenient caravan site for the marina. Ellesmere has various events centred around the meres including festivals, the annual regatta and carnival. Ellesmere is a lovely place for quiet country walks and cycling. The canals are quiet and peaceful with an abundance of wildlife, especially for bird-watching. Local public footpaths are well maintained, following an extensive renewal of signposts, stiles and footbridges in recent years. The Land’s End to John o’Groats ‘End-to-End’ bicycle route in the ‘Bike Britain’ cycle guide book goes past the end of our farm drive. We are within a short distance mile of National Cycle Network Route 455 (you can see former Route 31 from our farm). Cycling is allowed on the canal tow-paths but please note that not all towpaths are suitable for cycling. Birch Hill also provides convenient accommodation for visiting friends or relatives at the Robert Jones & Agnes Hunt Orthopaedic Hospital, or Derwen College both at Gobowen, about 8 miles away. The farm at Birch Hill was built about 1885 as part of the Oteley Estate. It was bought from the Estate by Richard & Gwen Copnall on 2 Nov 1965. As well as being farmer-butchers, they opened the CL for touring caravans on 1 March 1982. It became a popular site and Gwen Copnall went to The House of Commons to collect the 1987 runner-up prize in the Caravan Club National CL of the Year Competition. Gwen sold the house on 12 July 1993 and Sally-Anne Burgess continued to run the CL, doubling the size of the site to about 2 acres, spreading into an additional field to offer wider views. On 31 July 2002 Birch Hill was bought by the Kelly family, who now live in the farmhouse at Birch Hill. We have worked hard to improve the site and like to make people welcome when they arrive; we were delighted to have been awarded one of only 6 Regional Prizes in the 2006 CL of the Year Awards. This was followed by winning National First Place in the 2007 CL of the Year Competition, with the award made in the House of Commons in April 2008. 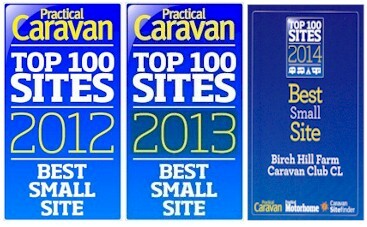 In 2010, readers of ‘Practical Motorhome‘ magazine voted us one of the top five-van sites in the country. In 2010, Ian Kelly was nominated by the Caravan Club to attend a Royal reception for people involved with rural communities: this was hosted by the Queen and Duke of Edinburgh at Windsor Castle on 17 November 2010. In 2012 we received the ‘Practical Caravan’ magazine award as the Best Small Site in the UK, going on to win the same prize in 2013 and again in 2014. Our nearest large Caravan Club Site is Lady Margaret’s Park at Chirk, 9 miles away. It has over 100 pitches.